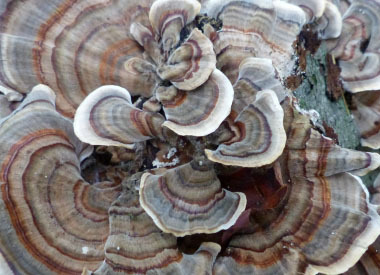 Overview: Turkey tails are one of the most common fungi in Canada and throughout the U.S. It is found virtually anywhere there are dead hardwood logs. Its cap colours are quite variable with sharply contrasting concentric zones of colour. They typically grow in rows or overlapping shelves. In Chinese medicine it is referred to as yun zhi, and the Japanese name is kawaratake. This fungi is full of a protein-bound molecule known as PSK, or polysaccharide K. Many polysaccharides (including PSK) have been shown to boost the immune system to fight infection and many different types of cancers. Distinguishing Features: The cap of a turkey tail measures anywhere between 2 to 10 cm (1 to 4”) across, with an outer edge that may be either smooth and uniform or lobed and wavy. The cap is characterized by defined bands of different colours, which include various shades of cream, grey, yellow, orange and brown. The cap surface is finely fuzzy or velvety. 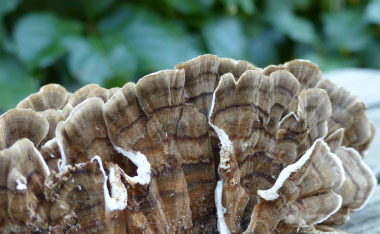 Many turkey tails clearly resemble a miniature turkey’s tail. The white inner flesh is 1 to 2 mm thick and rubbery. The underside is covered in tiny, shallow pores spaced about 3 to 6 pores per millimetre. 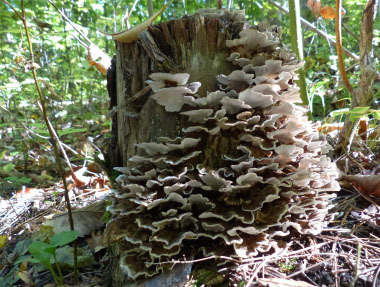 Height: Being a bracket fungi it virtually has no height. 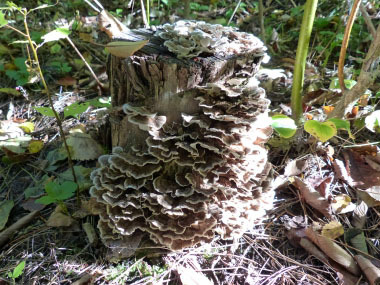 Habitat: Turkey tails grows on dead, deciduous wood, in the wounds of living hardwood trees, and on conifers throughout Canada, the U.S., and in many countries worldwide. Spore print: The spore surface (and spores) are white. Season: In the northern hemisphere, turkey tail fruiting season is typically May through December. 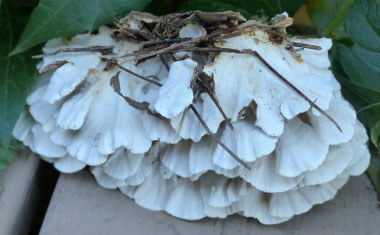 Although some may persist year-long depending on location and conditions, they are at their best in autumn and winter when they release their spores. Gills: Turkey tails do not have gills, they have pores. Edibility: This fungi is not palatable due to its tough texture. When fresh it is best used as a tea. Collecting turkey tails and drying them out is recommended. Once dried they can still be used to make tea, add to other teas, used in soups and in other meals. 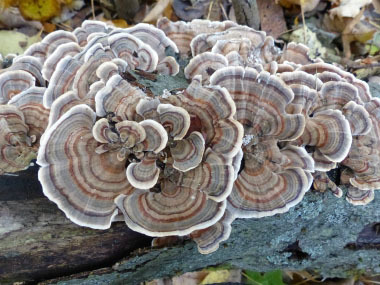 According to www.midwestmycology.org: "There are, however, no poisonous species of Trametes anywhere in the world, and most have medicinal properties."